Nationally known garden expert and television host Joe Lamp’l will speak at the 26th annual Gardening in the Northern Neck (GNN) seminar. Hosted by the Northern Neck Master Gardeners (NNMG) and Virginia Cooperative Extension, the seminar will be presented March 23 at the White Stone Church of the Nazarene, 57 Whisk Drive, White Stone. The seminar theme is “The Resilient Garden: Planning and Planting for Changing Conditions,” reported NNMG president Henry Riely. Other speakers will include Jenny Rose Carey, senior director of the Pennsylvania Horticultural Society’s Meadowbrook Farm and Joe Murray, a certified arborist, lecturer and writer. “We’re pleased to bring such high quality speakers to this year’s GNN. 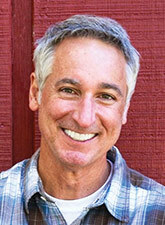 Joe Lamp’l is one of the country’s most recognized and trusted personalities in gardening and green-living. His presentation will be a highlight for all in attendance,” said Riely. Lamp’l’s passion for teaching is obvious to a nationwide audience in his current role as creator, executive producer and host of the award-winning PBS series, Growing a Greener World®. Lamp’l was host of Fresh from the Garden on DIY Network as well as on-air contributor to The Today Show, Good Morning America and The Weather Channel. He also is the founder and “Joe” behind joegardener.com®, a website dedicated to all things gardening and horticulture through how-to videos, podcasts, articles and blog posts. “Gardening in the Northern Neck has become one of the go-to gardening events in this area,” said GNN co-chairman Tami McCauley. “In the last several years, the attendance has reached or exceeded 300 people. We sold out last year and, with speakers like Joe Lamp’l, Jenny Rose Carey and Joe Murray, I expect another sellout this year. “Registration opens on February 1 and I encourage anyone who is interested to register early so they don’t miss this premier event,” said McCauley. Registration is $35.00. Lunch is available for an additional cost. Registration forms will be available at www.nnmg.org, or call the Virginia Cooperative Extension Northumberland County Office, 580-5694.